AWS Documentation » AWS CodeCommit » User Guide » What Is AWS CodeCommit? AWS CodeCommit is a version control service hosted by Amazon Web Services that you can use to privately store and manage assets (such as documents, source code, and binary files) in the cloud. For information about pricing for CodeCommit, see Pricing. CodeCommit is in scope with many compliance programs. For details about AWS and compliance efforts, see AWS Services In Scope by Compliance Program. For information about this service and ISO 27001, a security management standard that specifies security management best practices, see ISO 27001 Overview. For information about this service and the Payment Card Industry Data Security Standard (PCI DSS), see PCI DSS Overview. For information about this service and the Federal Information Processing Standard (FIPS) Publication 140-2 US government standard that specifies the security requirements for cryptographic modules that protect sensitive information, see Federal Information Processing Standard (FIPS) 140-2 Overview and Git Connection Endpoints. How Is CodeCommit Different from File Versioning in Amazon S3? How Do I Get Started with CodeCommit? CodeCommit is a secure, highly scalable, managed source control service that hosts private Git repositories. CodeCommit eliminates the need for you to manage your own source control system or worry about scaling its infrastructure. You can use CodeCommit to store anything from code to binaries. It supports the standard functionality of Git, so it works seamlessly with your existing Git-based tools. Benefit from a fully managed service hosted by AWS. CodeCommit provides high service availability and durability and eliminates the administrative overhead of managing your own hardware and software. There is no hardware to provision and scale and no server software to install, configure, and update. Store your code securely. CodeCommit repositories are encrypted at rest as well as in transit. Work collaboratively on code. CodeCommit repositories support pull requests, where users can review and comment on each other's code changes before merging them to branches; notifications that automatically send emails to users about pull requests and comments; and more. Easily scale your version control projects. CodeCommit repositories can scale up to meet your development needs. The service can handle repositories with large numbers of files or branches, large file sizes, and lengthy revision histories. Store anything, anytime. CodeCommit has no limit on the size of your repositories or on the file types you can store. Integrate with other AWS and third-party services. CodeCommit keeps your repositories close to your other production resources in the AWS Cloud, which helps increase the speed and frequency of your development lifecycle. It is integrated with IAM and can be used with other AWS services and in parallel with other repositories. For more information, see Product and Service Integrations with AWS CodeCommit. Easily migrate files from other remote repositories. You can migrate to CodeCommit from any Git-based repository. Use the Git tools you already know. CodeCommit supports Git commands as well as its own AWS CLI commands and APIs. 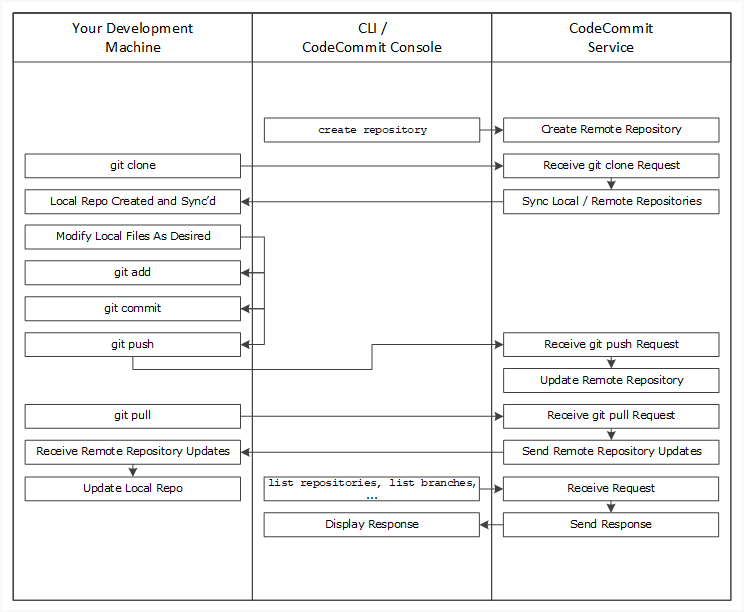 As a Git-based service, CodeCommit is well suited to most version control needs. There are no arbitrary limits on file size, file type, and repository size. However, there are inherent limitations to Git that can negatively affect the performance of certain kinds of operations, particularly over time. You can avoid potential degredation of CodeCommit repository performance by avoiding using it for use cases where other AWS services are better suited to the task. You can also optimize Git performance for complex repositories. Here are some use cases where Git, and therefore CodeCommit, might not be the best solution for you, or where you might need to take additional steps to optimize for Git. Large files that change frequently Git uses delta encoding to store differences between versions of files. For example, if you change a few words in a document, Git will only store those changed words. If you have files or objects over 5 MB with many changes, Git might need to reconstruct a large chain of delta differences. This can consume an increasing amount of compute resources on both your local computer and in CodeCommit as these files grow over time. To version large files, consider Amazon Simple Storage Service (Amazon S3). For more information, see Using Versioning in the Amazon Simple Storage Service Developer Guide. Database Git repositories grow larger over time. Because versioning tracks all changes, any change will increase your repository size. In other words, as you commit data, even if you delete data in a commit, data is added to a repository. As there is more data to process and transmit over time, Git will slow down. This is particularly detrimental to a database use case. Git was not designed as a database. To create and use a database with consistent performance regardless of size, consider Amazon DynamoDB. For more information, see the Amazon DynamoDB Getting Started Guide. Audit trails Typically, audit trails are kept for long periods of time and are continuously generated by system processes at a very frequent cadence. Git was designed to securely store source code generated by groups of developers on a development cycle. Rapidly changing repositories that continually store programmatically-generated system changes will see performance degrade over time. To store audit trails, consider Amazon Simple Storage Service (Amazon S3). To audit AWS activity, depending on your use case, consider using AWS CloudTrail, AWS Config, or Amazon CloudWatch. Backups Git was designed to version source code written by developers. You can push commits to two remote repositories, including a CodeCommit repository, as a backup strategy. However, Git was not designed to handle backups of your computer file system, database dumps, or similar backup content. Doing so might slow down your system and increase the amount of time required to clone and push a repository. For information about backing up to the AWS Cloud, see Backup & Restore. CodeCommit is familiar to users of Git-based repositories, but even those unfamiliar should find the transition to CodeCommit relatively simple. CodeCommit provides a console for the easy creation of repositories and the listing of existing repositories and branches. In a few simple steps, users can find information about a repository and clone it to their computer, creating a local repo where they can make changes and then push them to the CodeCommit repository. Users can work from the command line on their local machines or use a GUI-based editor. Use the AWS CLI or the CodeCommit console to create a CodeCommit repository. From your development machine, use Git to run git clone, specifying the name of the CodeCommit repository. This creates a local repo that connects to the CodeCommit repository. Use the local repo on your development machine to modify (add, edit, and delete) files, and then run git add to stage the modified files locally. Run git commit to commit the files locally, and then run git push to send the files to the CodeCommit repository. Download changes from other users. Run git pull to synchronize the files in the CodeCommit repository with your local repo. This ensures you're working with the latest version of the files. You can use the AWS CLI or the CodeCommit console to track and manage your repositories. CodeCommit is optimized for team software development. It manages batches of changes across multiple files, which can occur in parallel with changes made by other developers. Amazon S3 versioning supports the recovery of past versions of files, but it's not focused on collaborative file tracking features that software development teams need. Follow the steps in Setting Up to prepare your development machines. Follow the steps in one or more of the tutorials in Getting Started. Create version control projects in CodeCommit or migrate version control projects to CodeCommit. Pro Git, an online version of the Pro Git book. Written by Scott Chacon. Published by Apress. Git Immersion, a try-it-yourself guided tour that walks you through the fundamentals of using Git. Published by Neo Innovation, Inc.
Git Reference, an online quick reference that can also be used as a more in-depth Git tutorial. Published by the GitHub team. Git Cheat Sheet with basic Git command syntax. Published by the GitHub team. Git Pocket Guide. Written by Richard E. Silverman. Published by O'Reilly Media, Inc.